Interstate 25 has 15 active business routes and four former routes along its 1,063 mile course. 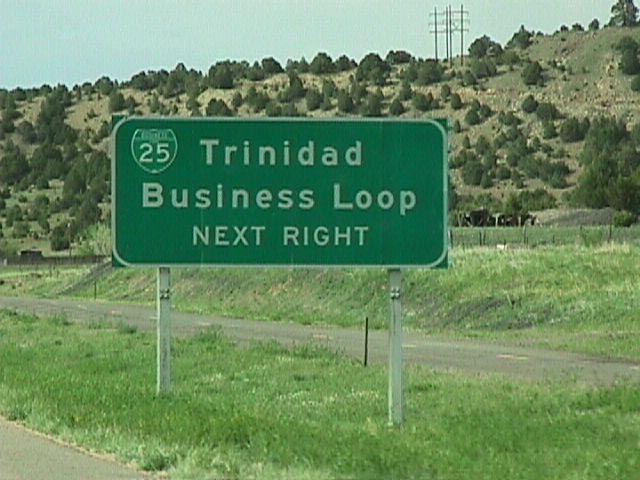 Business Loop I-25 winds 5.71 miles east through the city of Truth or Consequences between Exits 75 and 79. Broadway Street (old U.S. 85) leads the route northeast from the village of Willamsburg to Downtown T or C, where it splits into a one-way couplet with Main Avenue westbound. Date Street continues the route north back to I-25. The business loop is well-signed and links to New Mexico 51 (Third Avenue). It is inventoried as BL-11-P by NMDOT. The 2.88 mile long business route (BL-12-P) in Socorro overtakes old U.S. 85 along California Street from a trumpet interchange (Exit 147) and access road leading north from I-25. U.S. 60 accompanies Business Loop I-25 (California Street) between Spring Street and the north end at Exit 150. Interstate 25 bypasses the city of Belen to the west as the business route lines old U.S. 85 north along Main Street from Exit 190. New Mexico 314 used to run concurrent with the route, but now begins at the Belen North interchange between Main Street and the Business Loop I-25 expressway leading west to Exit 195. The NMDOT Posted Route Legal Descriptions lists BL-13-P at 6.65 miles in length. Maps of Santa Fe from the 1980s and 1990s indicated a Business Loop I-25 through Santa Fe via Cerrillos Road (old U.S. 85), St. Michaels Drive (old U.S. 85 Bypass) and Old Pecos Trail (old U.S. 84 & 285). However, as investigated in 2008, the routing was signed as parts of New Mexico 14 and New Mexico 466.
Business Loop I-25 in Las Vegas follows Grand Avenue (old U.S. 85) north from FR 2137 and Exit 343 to Exit 347 and NM 250 (a 4.50 mile route to Las Vegas Municipal Airport). Trailblazers line the route for New Mexico 518, which begins at the intersection of Grand Avenue and Seventh Street Downtown. NM 518 ventures 72.90 miles northwest to NM 68 at Taos via Mora. BL-15-P travels 4.24 miles overall. This business loop follows Maxwell Avenue and Railroad Avenue along historic U.S. 85 between Exits 412 and 414. It provides the connection from Interstate 25 to U.S. 56 & 412 east and New Mexico 21 west. While referenced on guide signs from the I-25 mainline at both ends, the 3.43 mile route through the city of Springer is otherwise unsigned. NMDOT inventories it as BL-16-P. The Raton business route for I-25 follows Second Street north from Exit 450 to the city center, and Canyon Drive back to I-25 at Exit 454. Listed as BL-17-P by NMDOT, the 4.16 mile alignment along old U.S. 85 & 87 is well signed. Business Loop I-25 was formerly referenced at Exit 13 along I-25 north for the now removed folded diamond interchange. The route likely took Animas Street southeast to Main Street (old U.S. 160 & 350). A 2009 reconstruction project of I-25 through Trinidad included the replacement of the northbound viaduct section crossing the Purgatorie River. Subsequent work in 2011 reconstructed southbound, with a new diamond interchange built at Main Street to replace the antiquated ramps at University and Animas Street. This resulted in the removal of Business Loop I-25 signage, though one guide sign remained on I-25 southbound and a reassurance marker was posted along the route northbound as of April 2017. The lone business spur for I-25 angles 1.95 miles southwest from Exit 34 along Lynn Road and Fir Street. Business Spur I-25 follows an old alignment of U.S. 85-87-160. The route concludes with an end sign at the Fir Street intersection with Main Street in Aguilar. Business Spur I-25 to Aguilar was largely unsigned with only one shield at its western end and no mention from the mainline freeway previously. 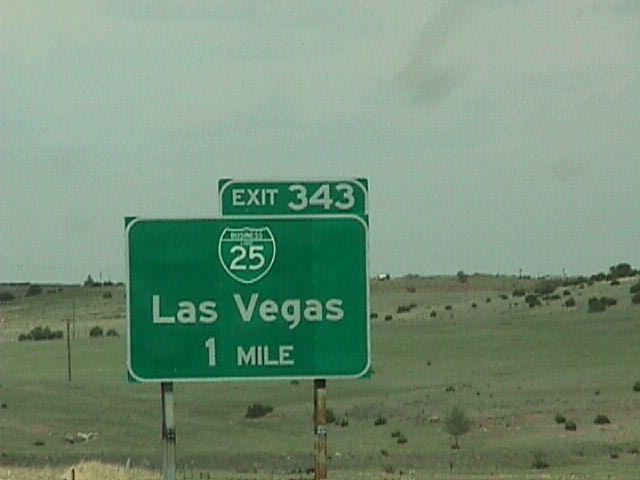 This changed by August 2012, when ample signs were erected along the entirety of the route and on the Interstate 25 northbound mainline. CDOT inventories the business spur as Route 025B. 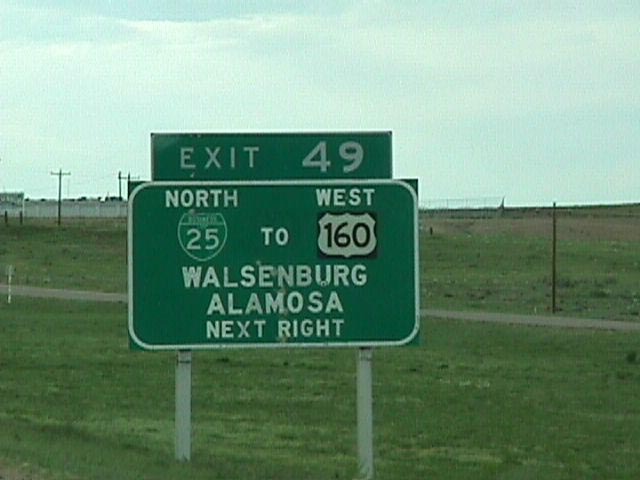 Inventoried by CDOT as Route 025C, the 4.04-mile business loop for Walsenburg runs west from Exit 49 to Main Street (old U.S. 85-87) and the city center. Walsen Avenue extends the route northward to I-25 at Exit 52. U.S. 85 & 87 remain paired with I-25 instead of overlapping with the business route. U.S. 160 travels 5th Street west from Exit 50 of I-25 to Main Street, where it joins Business Loop I-25 for two blocks south to 7th Street. Shields are posted for U.S. 160 along 5th Street, but signing at Downtown Walsenburg, and on the Interstate 25 mainline, direct motorists following U.S. 160 to use the southern half of Business Loop I-25 instead. The Colorado Springs business route used to extend from Exits 140 to 148 on the east side of Interstate 25 along Nevada Avenue. Like most other business loops along Interstate 25 in Colorado, the route was concurrent with old U.S. 85-87, but neither US route were cosigned with Business Loop I-25 during the 1990s-2000s time frame. This business loop was 6.75 miles long per CDOT. Actions taken on October 1, 2007 decommissioned the business loop, along with portions of several other state routes in Colorado Springs (such as SH 83 and SH 38) while the new SH 21 (Powers Road) alignment was added at the same time. Part of old U.S. 85-87, this loop used to follow Plum Creek Parkway east from Exit 181 to Wilcox Street, and Wilcox Street north to Exit 182. The 1.2 mile route was decommissioned by 1996 and likely was never signed. Subsequent actions realigned SH 86 away from 5th Street to no longer end at former Business Loop I-25 in Downtown Castle Rock. SH 86 was realigned onto Founders Parkway north to Exit 184 so that it no longer ended at a locally maintained route. Business Loop I-25 travels 7.9 miles east from I-25 through Cheyenne alongside Business U.S. 87 between Exits 7 and 12. The southernmost segment of Business Loop I-25 and Business U.S. 87 is an east-west leg that overlaps with Wyoming 212 (College Drive) between Exit 7 and Central Avenue, where the business route combines with U.S. 85 northward to Interstate 80. Northward at Exit 362 of I-80, Business Loop I-25, U.S. 85, and Business U.S. 87 are joined by I-180. Despite the Interstate 180 designation, Central Avenue remains an at-grade boulevard with traffic signals and a speed limit of 40 miles per hour. However, this is the best route from Interstate 80 into Downtown Cheyenne, as it has twin viaducts that carry Central Avenue over the large Union Pacific Railroad yard. Upon descending from the viaducts, Business Loop I-25, U.S. 85, U.S. 87 Business, and I-180 meet Business Loop I-80 and U.S. 30 (Lincolnway / 16th Street). Interstate 180 ends at this traffic signal complex, and the northbound and southbound directions separate into a one-way couplet (Central Avenue south and Warren Avenue north) from Business Loop I-80 and U.S. 30 (Lincolnway / 16th Street) to Cheyenne Regional Airport (CYS). As Cheyenne is the capital city of Wyoming, the business route passes near the Wyoming state governmental complex, steering close to the Wyoming State Capitol and Wyoming State Museum, among other Wyoming state buildings. North of Cheyenne Regional Airport, Warren Avenue forms a multi-lane arterial to Central Avenue, which returns the business route to Interstate 25 across from F.E. Warren Air Force Base at Exit 12. Business Loop I-25 and Business U.S. 87 end at this point, while U.S. 85 joins Interstate 25 and U.S. 87 north. A short spur also carries Wyoming 224 to additional state governmental buildings on the west side of the diamond interchange at Exit 12.
Business Loop I-25 combines with U.S. 87 Business (Yellowstone Highway) along a 3.4 mile route through the town of Chugwater. 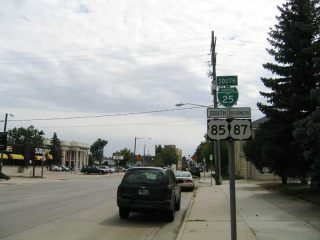 The route combines with Wyoming 313 east from Exit 54 to 1st Street, where the two join old U.S. 87 to Lone Tree Road. There WYO 313 branches east toward U.S. 85 while Business Loop I-25 parallels I-25 north along side WYO 321 (Ty Road) to Exit 57. The Wheatland business route for I-25 follows a staggered route town along a nearly three mile route. Beginning at Exit 78, Business Loop I-25 & U.S. 87 Business take Mariposa Parkway east to 16th Street north and South Street east to Downtown. 9th Street leads the routes north to WYO 320, where the business route loops west to I-25 at Exit 80. U.S. 20 & 26 overlap with Interstate 25 & U.S. 87 northward to Douglas. A five-mile business route for I-25 loops through the Converse County seat. The loop doubles as Business routes for all three US highways as it overtakes Yellowstone Highway northwest of Exit 135. The four-way overlap takes Richards Street to 4th Street and the city center. Center Street takes the batch west to Yellowstone Highway across the North Platte River toward a trumpet interchange (Exit 140) with Interstate 25. U.S. 20-26-87 split with Interstate 25 and remain on their original route west through the town of Glenrock and Casper. Business Loop I-25 to Glenrock begins at Exit 160 near the Dave Johnston Power Plant. The business route departs the freeway along side U.S. 20-26-87 to become Birch Street three miles to the west at the town line. Within Downtown Glenrock, Business Loop I-25 separates from the US highways. 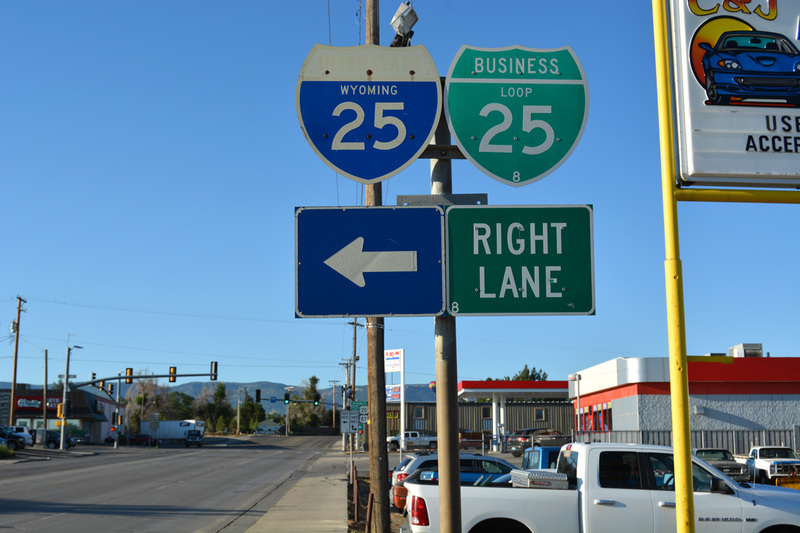 While U.S. 20-26-87 proceed west toward Casper, Business Loop I-25 cosigns with Wyoming 95 in a southwesterly direction along Fourth Street to rejoin Interstate 25 at Exit 165.
Business Loop I-25 in Casper is a 2.1 mile long route that serves downtown Casper. It is rarely shown on most street maps of Casper. For motorists traveling northbound, Business Loop I-25 and its companion, Business U.S. 87 depart Interstate 25 & U.S. 20-26-87 at a complex interchange (Exit 186). Although signed as north and westbound, the business route actually travels due south on Beverly Street until reaching East Yellowstone Highway, which is Business U.S. 20-26. The four business routes proceed southwest along Yellowstone Highway until a scissors-style intersection with First Street. Beyond this intersection, the four routes shift onto First Street into downtown Casper. Within Downtown at the intersection with Center Street (former Wyoming 255), Business Loop I-25 and Business U.S. 87 turn north onto Center Street, which is maintained by the city of Casper. The pair end at Exit 188A, where they again meet Interstate 25. The northbound business route utilizes the F Street service road to reconnect with I-25 at the Poplar Street (Wyoming 220) on-ramp. As an aside, Business U.S. 20-26 continue west along First Street, which eventually becomes known as West Yellowstone Highway. 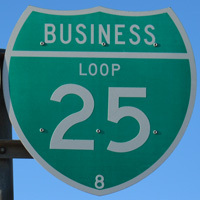 Notably, at the junction between Business U.S. 20-26, Bypass U.S. 20-26, and Wyoming 257 (West Casper Belt Loop), some trailblazer shields remain for Business Loop I-25 along westbound Business U.S. 20-26. Traveling southbound, the business route is almost identical to the northbound route, with the exception of the southern terminus. Rather than utilizing any portion of Beverly Street, signage for southbound Business Loop I-25 and Business U.S. 87 point to a direct ramp leading from eastbound Yellowstone Highway onto Interstate 25 south. This on-ramp is just west of the Wyoming Boulevard (Wyoming 258) interchange (Exit 185). Interestingly, it is at this point where mainline U.S. 20-26-87 proceed east along Yellowstone Highway toward the Sinclair Oil Refinery and eventually toward the city of Glenrock. Business Loop I-25 in Casper is thoroughly signed, but as sometimes occurs along Interstate business routes in Wyoming, erroneous tri-color Interstate shields (without a “To” banner) are posted at multiple locations along the route as of August 2016. Also signed as Business U.S. 87, Business Loop I-25 travels 3.4 miles overall as it connects Interstate 25 with Downtown Buffalo and U.S. 16 west across the Bighorn Mountains. The business route begins at Exit 298 from Interstate 25. The tandem enter the historic district of Buffalo following Main Street, which crosses Clear Creek near the historic Occidental Hotel and comes within two blocks of Buffalo City Park. The city park is notable for having what is billed as the largest outdoor swimming pool in Wyoming, and it is free for the public to use the pool during operating hours. Near the Johnson County Courthouse, Business Loop I-25 & Business U.S. 87 meet U.S. 16 at Fort Street. Main Street carries the three routes northward between Fort Street and Hart Street. Once at Hart Street, U.S. 16 again turns east along with eastbound Business Loop I-90, as Business Loop I-25 & Business U.S. 87 north are joined by westbound Business Loop I-90. From this point northward along Main Street, the business route signage tends to favor the return to Interstate 90 with trailblazers showing “To Interstate 90” and North Business U.S. 87. The three business routes end at Exit 56A of Interstate 90 as the northward extent of Business Loop I-25 matches the northern terminus of Interstate 25 (located just to the east at Exit 56B). Heading southbound, Business Loop I-25 & Business Loop I-90 are cosigned along with Business U.S. 87 from the point they depart Interstate 90 at Exit 56A to Hart Street, where the business route meets U.S. 16 east and the two Interstate business loops separate. Approaching the Las Vegas, New Mexico business loop for I-25 on Interstate 25 north. Replacement signs here include shields for NM 283 and NM 329. Photo taken by Mike Ballard (1998). 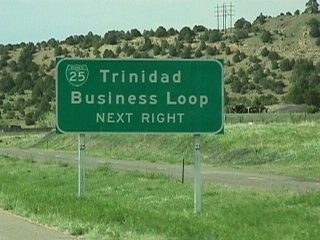 The lone sign posted for Business Loop I-25 on I-25 north through Trinidad, Colorado was this panel for Exit 13. Photo taken by Mike Ballard (1998). 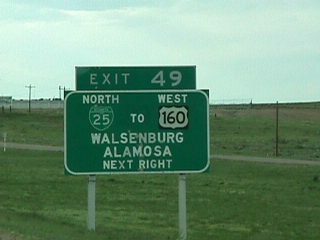 Former ground level sign on I-25 north for Business Loop I-25 north into Walsenburg, Colorado. Photo taken by Mike Ballard (1998). Business Loop I-25, U.S. 85, and U.S. 87 Business southbound reassurance shields posted on Central Avenue in Cheyenne, Wyoming. Photo taken 09/01/04.